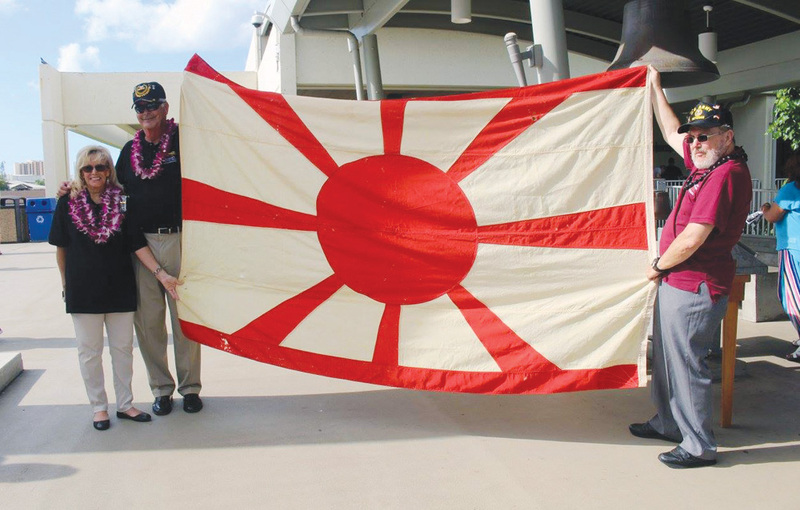 A hand-sewn Japanese flag that once flew over the ship where Adm. Isoroku Yamamoto gave the order to attack Pearl Harbor was donated to World War II Valor in the Pacific National Monument on Oct. 13. Dianne Hall presented the flag, which belonged to her father, Robert Hartman. U.S. Navy seaman Robert Hartman served on the USS Horace A. Bass, one of the ships present when the Japanese battleship Nagato, once Adm. Yamamoto’s flagship, surrendered in the Tokyo Bay area in August 1945. U.S. sailors from nearby ships were allowed to board the Nagato and remove key pieces of memorabilia. Hartman found the Nagato’s flag. Over the years, the wool, red-and-white flag became a familiar item to his family, sometimes even used as a blanket on cold winter nights. Following Hartman’s death in 1999, the flag was passed on to his daughter Dianne, who traveled from North Carolina to present the flag to the National Park Service. Previous Previous post: You Make it Happen!